This video is a summary of the activities on the farm for 2017. It covers cultivating the Alfalfa, disking, sprinkling, cutting hay (swathing), raking hay, baling hay, hauling hay, and feeding the beef cattle. Tractors in use are a John Deere 4230, 4640 FWA, 4020 Diesel PowerShift, 3020 Diesel PowerShift, 630 gas, and 730 Diesel. Also shown are models 420 Utility, 435 Diesel, and a Model A. Videos are shot with an iPhone and DJI Phantom 4. 2017 was a very busy year, with a lot of accomplishments, and a few failures. This was also the first full year with the new Reinke center pivot, which greatly increased the farm yield. Hopefully, 2018 will be a successful year, filled with many new adventures and prosperity. 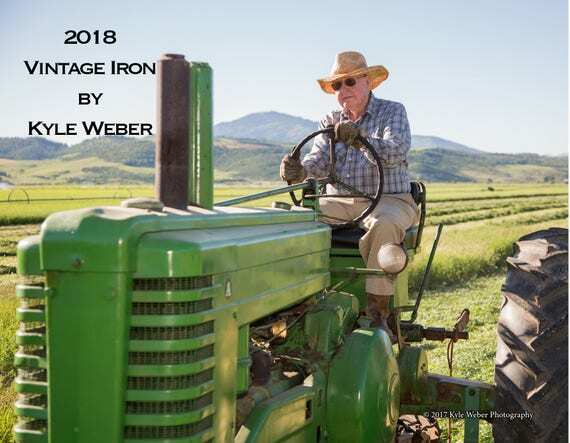 The 2018 Vintage Iron Calendar is live! This year’s calendar features and is dedicated to my grandfather, who is in the cover photo. Check it out. If you decide to purchase one, thanks for supporting my photography. 2018 Vintage Iron Calendar. Featuring different John Deere 2 cylinder tractors, photographed in Star Valley Wyoming. Over the past few years, I’ve had several requests to create a calendar featuring some of my tractor and nature photography. Well, I finally built up the ambition to go and print/create such calendar. I’m introducing the 2017 Old Iron calendar, featuring some of my tractor photos taken throughout different times of the year. I only have John Deere tractors, so the calendar is mostly John Deere (with one exception in December). Please visit the following link to view/order a calendar. Thank you very much!! Even though we sold the dairy a few years ago, we still have a few beef cattle. It’s kind of fun feeding them when dad isn’t doing it. Here’s a few random photos of our cattle feeding experiences.